if you can’t change your circumstances, change your expectations. So often, our frustration results from unmet expectations. That frustration often leads to anger, sometimes to sadness and frequently, to a boatload of behaviors we regret, words we wish we could take back, and hurts we would inflict upon ourselves if only it meant we could spare those whom we caused pain. One thing I consistently strive to do is to adapt my expectations to whatever circumstances I face. Rather than trying to force things to go the way I think they should, or to manipulate situations to be the way I want them to be, or (what I desperately, vehemently, REFUSE to do) to scream at people I love or have never met before, complain to anyone I can trap, or constantly mumble in discontent, making everyone around me uncomfortable, I try to figure out how God can be glorified by the fact that I’m smack in the middle of those circumstances. Why did God allow me to be here? What does He want me to do? One blessing God gave me is a daughter who is what my counselor has called “undamaged Julie.” Maybe so. But what that ultimately means to me is that my daughter is very much different from me. Her behaviors and emotions are SOOO different than mine. She lives out loud and wears her emotions all over every body part, not just her sleeves. I’m . . . reserved. So how do I handle that? I have a totally different set of expectations for PinkGirl than I would for “my daughter.” And there is a difference. I don’t define PinkGirl from my own frame of reference. I don’t see her as an extension of myself, but rather as her own person. I provide encouragement and tangible support and instruction for her dreams and goals and I CAN NOT wait to find out what she will do next. And no. I do not find this response intuitive. It’s a determined choice I make, not because I’m a great mother, but because I’m damaged. And no, I don’t want to talk about it. I’m reserved, remember? So, what do you do with meat that’s gotten a little freezer burn because it’s been left in the freezer longer than it should have been? Don’t throw it away! Around the holidays, FirstHusband smokes an abundance of meat in the smoker because he can’t seem to use his smoker unless he completely FILLS his smoker. Then, for days after, we eat all the smoked meat we can eat . . . and freeze all the smoked meat we can’t eat. Then, just before the holidays the next year, we realize we need to make room for this year’s abundance of meat, so we start pulling out what’s left over from the year before. Often, it’s on the edge (or over the edge) of freezerburn. 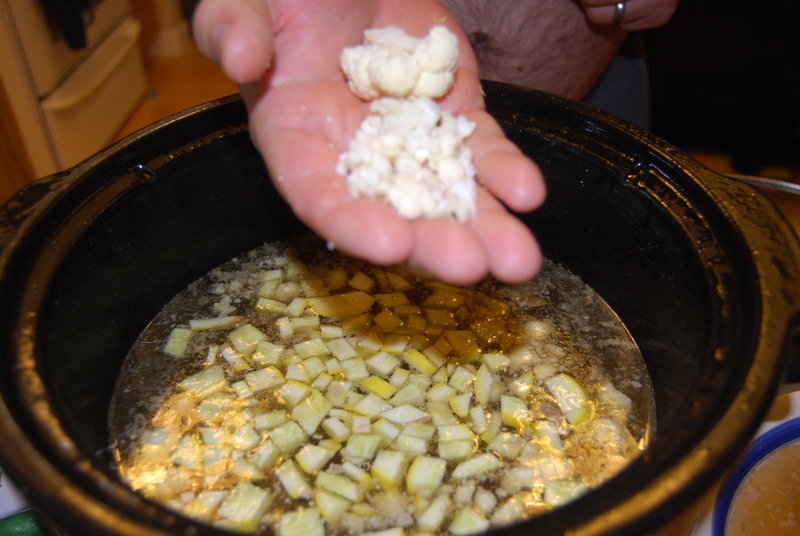 Rather than throw it out, FirstHusband invented Freezerburn Soup. 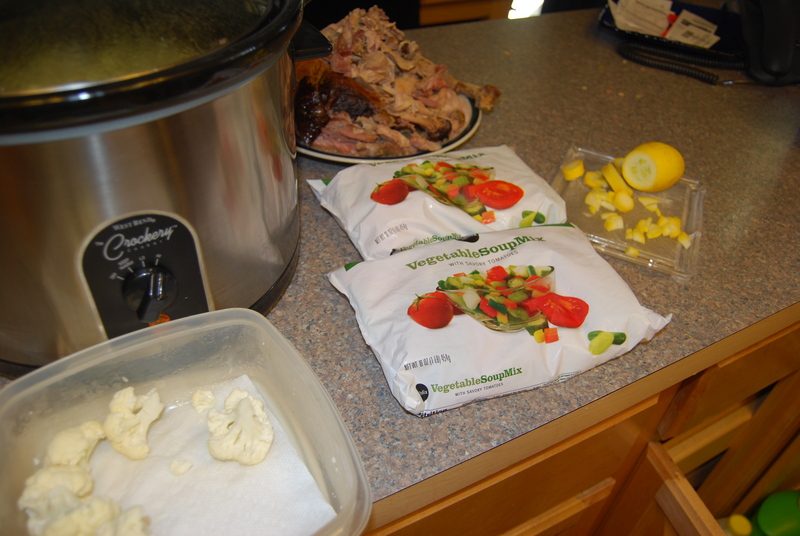 He fills the crockpot with the the frozen meat, covers it with vegetable stock (we freeze stock and store it flat in ziplock bags). He turns the crockpot on overnight and we wake to a great smelling kitchen. 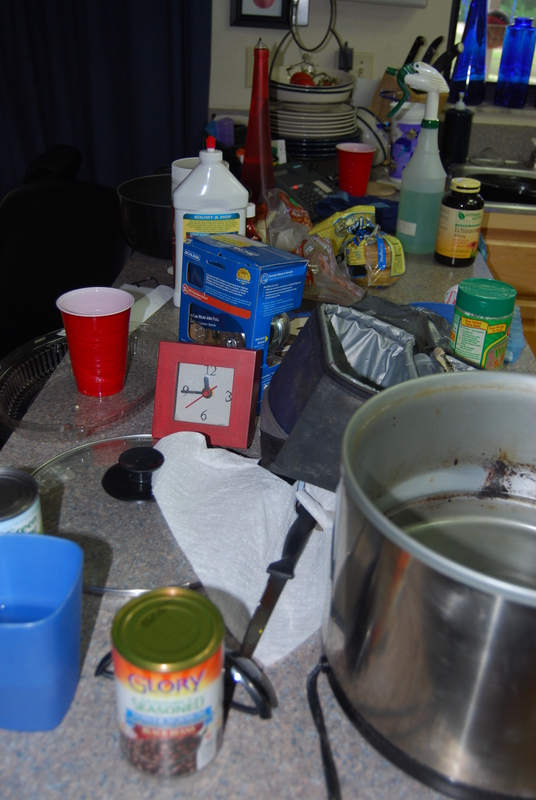 (And usually a counter of boiled over stock, but today wasn’t too much of a mess.) Then he removes the meat, lets it cool, de-bones it, puts it BACK in the crockpot with whatever veggies he can find.
. . . and torturing FavoriteSon with the waiting. That meat you thought was a goner has now been infused with stock for nearly 24 hours and is moist and tender! 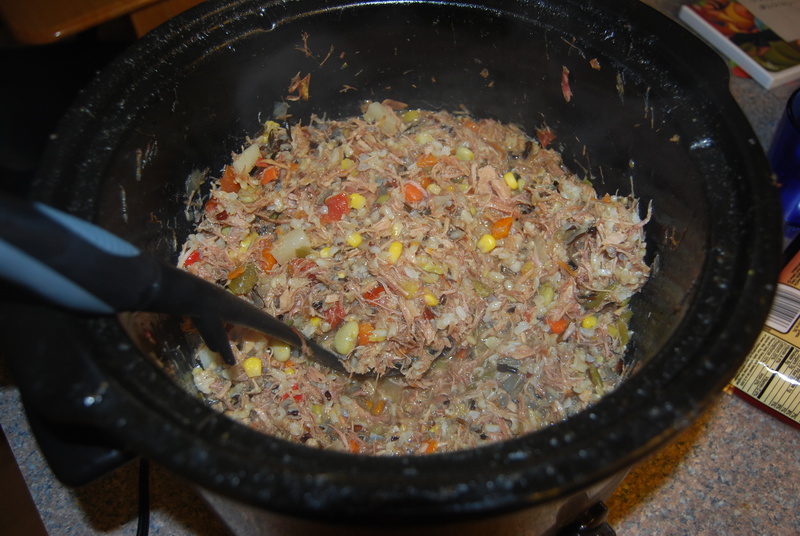 And then, if we’re lucky, we end up with this: half a crockpot of freezerburn soup. Unless we’re really hungry and eat the entire pot. There’s not really a recipe for this, it turns out different every time because FirstHusband changes the spices each time. He’s also used pasta instead of rice before. I wonder what orzo would do for this soup? hmmm. Until about two years ago, I didn’t think too much about my eyebrows. I plucked an obvious stray every once in a while, but for the most part, ehh. Problem is, I have sensitive skin. When I put benzoyl peroxide on my face, I get a bright red welt. When I use certain moisturizers or eye makeup, my eyes swell and appear very, very tiny. When I get a brow (and lip) wax, I get lots of tiny clear water blisters that take 2 to 3 days to go away. Nevertheless, I continued to get the waxing, figuring that a few days of blisters was the price I had to pay for arched brows and an “eyelash free” upper lip. WFMW Backwards Edition: What’s your best/favorite/unique effective PARENTING TIP? This week, the Works for Me Wednesday blog carnival is reversed. Instead of posting a great idea that works for me, I’m supposed to ask for tips. So here’s the deal. I’ve been outlining a book about pragmatic parenting and I’m looking for ideas outside my own resources and experience. What is your best/favorite/unique/effective PARENTING TIP? blogging, tweeting & facebooking. on the treadmill. Since September of 2007, I’ve been working with a personal trainer, focusing on strength training. I had some physical challenges, but since my hysterectomy last year, I’ve been much more consistent and I’m up to three days per week. And I’ve finally gotten to a place where the arthritis in my neck hardly ever necessitates the use of my home traction device. I’m feeling stronger and healthier than I have in a very, very long time and I’m very determined to continue getting stronger as I get older, not weaker. But I’ve always struggled with maintaining a consistent cardio workout. I like maximizing my time. I like to be pragmatic. So when it came to incorporating cardio into my daily life, I wanted . . .
No nagging – it’s safe – I promise. I only WALK on the treadmill. From 3.3 to 4 miles per hour. I do a little interval training, but no jogging. Doctor’s orders. Just walking. 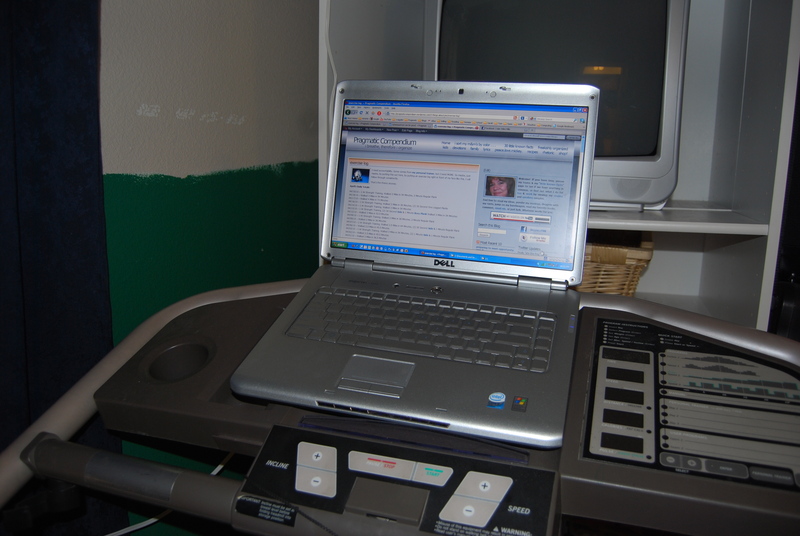 Resting the laptop on the treadmill console worked great – for certain things. Mostly passive, hands-off things. PERFECT for video training. PERFECT for reading onscreen. PERFECT for listening, learning and even rehearsing my praise team music for the week. Not so perfect for typing. At 3.3 miles per hour, typing was possible, but annoying. And slow. 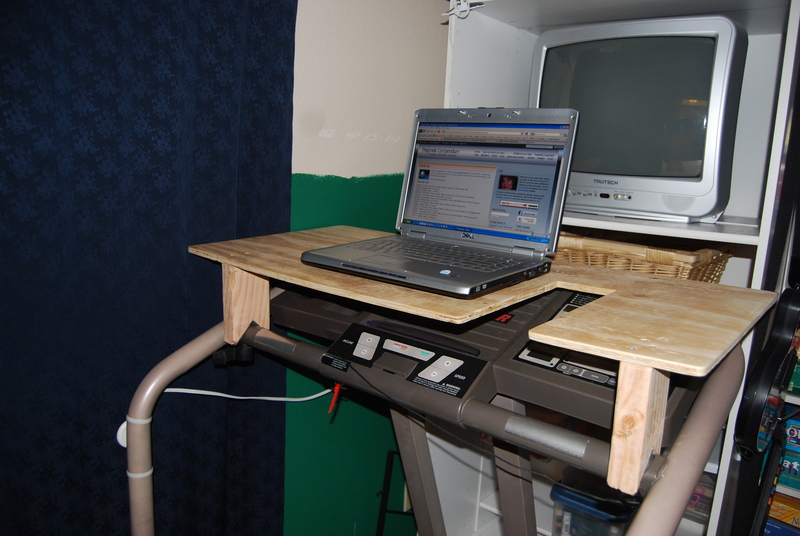 And I was worried that I would knock the laptop off the treadmill because it was perched with the left side higher than the right. Even more annoying. Too tiny. And the touch pad – with no independent buttons for clicking – ANNOYING. I was constantly clicking AWAY from things I wanted to click ON. arrg. 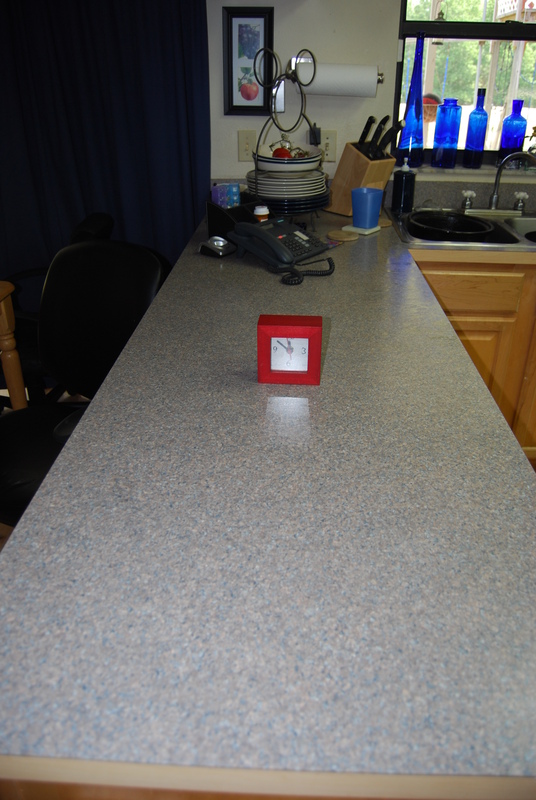 Then, Saturday morning, I asked my husband to think about what modifications could be made to provide a more stable surface for my laptop. I would also like room to put the house phone, my cell phone, the tv and cable remotes (in case I wanted to watch TV instead), a bottle of water and a small towel. oh, don’t worry. He knew I was high maintenance when he married me. Look what my man can do with $10, some power tools and a few hours! I’m LOVING this! Stable, with plenty of room and it even has a cutout so I can see the console panel. I still need to paint it, but it’s been three days and I absolutely LOVE it! In addition to the hands free tasks, I can type!!! So easy! I can facebook, tweet and blog, all while walking. The time FLIES by! The TV is mostly for FirstHusband and FavoriteSon (in case you’re new to Compendium, that would be my ONLY husband and my ONLY son). They use the small TV directly in front of the treadmill to play video games. It’s hooked up as a second monitor to the game system and larger TV on the other side of the room. It’s also hooked up to the cable box, so we can watch TV too. Now THIS is a sustainable cardio workout. What kind of sustainable workout routine works for you? 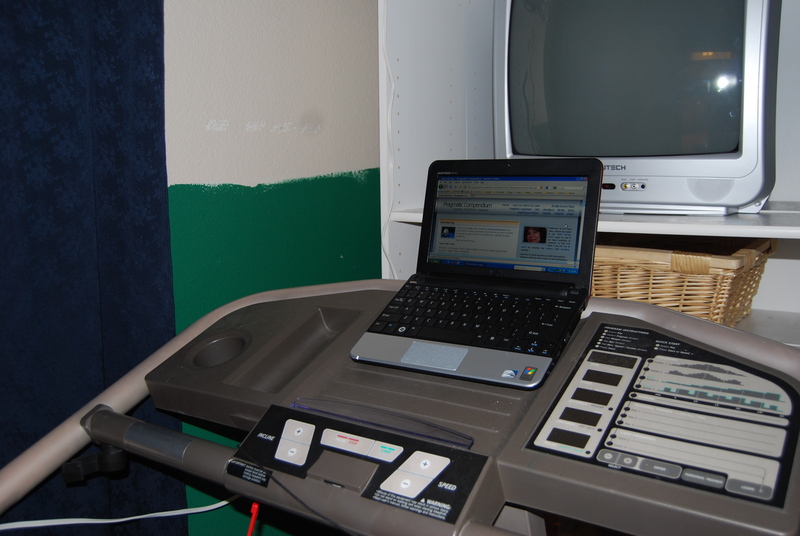 BTW, I just counted almost FIFTY treadmills listed on the Central Florida Craigslist since MONDAY. Just in case you’re interested. and just in case you missed this video earlier this week . . .
And do I listen to God? Thankfully he’s patient. But He got my attention yesterday. With an iron. ouch. For years, I’ve tinkered with ebay and consignment. Gathering up unneeded stuff and listing it on ebay, taking a load of stuff to the consignment shop for resale. Watching ebay snipers at the end of one of my auctions, spending consignment store credit instead of money. It’s fun. It’s work, but it’s fun. And in return, I get a little (and mean a LITTLE) extra cash for my effort. Unfortunately, for about two years, I hadn’t physically been able to do it so much. I was thankful I could keep up with daily life, forget dealing with purging or spring cleaning for ebay and consignment or any type of home project. Struggling with chronic anemia for 18 months or so, along with the escalating and life-intruding problems associated with the fibroid tumors I had for decades, then the hysterectomy that knocked out both the anemia and the fibroid tumors, but required months of recovering from major surgery . . . by the fall of last year, I was finally starting to feel “normal” again. I enjoyed becoming more active, spending time DOING things with my family instead of . . . not. Then, in November and December of last year, one of my clients upgraded and I got a LOT of work. A LOT of work. I was organizing stuff we no longer needed, spending hours cleaning and prepping and listing it/taking it to the thrift shop for sale and making a pittance. I mean a PITTANCE. When I had the courage and intention to factor in the hours spent – my “hourly wage” turned out to average less than I made babysitting in middle school. In the 1970s. Let’s face it. There are a lot of people who can do this and make it worth the effort. And then, out of the blue, God provided a tremendous blessing through a client project. A financial and professional and personal blessing I could NEVER begin to match in my efforts to sell on ebay or consignment. If I give up this particular activity, I will gain HOURS to spend on other work – work that could bring a lot more personal and professional and financial rewards than these distracting, time consuming, focus breaking tangents do. If I’m serious about diversifying my business and beginning a vocational ministry in faith-based speaking, singing and writing, I’ve got OTHER THINGS I NEED TO BE DOING. Okay. I had the epiphany. And I had the Red Cross pick up two huge loads of stuff in the last few months. I was packing up for another Red Cross pickup on Friday morning and I came across some nearly new, name brand, outgrown clothes of PinkGirls. But they need ironed. And right in the middle of ironing these clothes we DON’T NEED (I don’t iron the clothes we WEAR!!!!) . . .
“This isn’t about stuff and it isn’t about wasted time or ebay or consignment or fun or work or any of those things. It’s about me trying to control things. Doing what I can, in my feeble attempts, to provide extra money for my family, instead of trusting God to do it. And I know He can do a better job than I can. Stupid iron. I should give the it to the Red Cross. But I won’t. FirstHusband uses it. 1. Easter Bunny Cake. (with decorating photos) I HAD to include this post. It’s been inflating my blog stats like CRAZY over the last month! On the Saturday before Easter, it got 3,709 views! In the last 30 days it got over TWELVE THOUSAND views. And two comments saying thanks for the tip. Very weird. 2. 5 Minute Onions in a Flash (Freeze) (how to freeze onions) This post, again with photos, has consistently stayed in my Top 10 list for nearly a year now. 3. shredding meat 101. 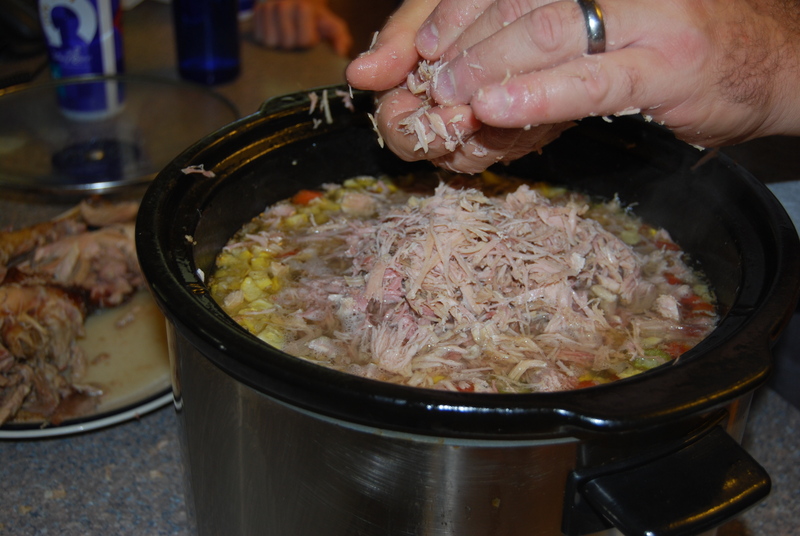 (how to shred meat) Even with no photos (just links to videos), this post has also stayed in my Top 10 List since I posted it in August of 2008. Glad to help. 4. The Underwear Principle. This is the foundation of my organizing style, based on my response to my newlywed husband throwing his underwear on the floor in the same place every day. It works with EVERYTHING, not just underwear! 5. Don’t File Paper Anymore.Every January, this series on paper organization gets slammed with hits. My first post: high fructose corn syrup “in moderation”, which was an informative post in response to those obnoxious commercials showing people silent and dumbfounded when asked “what they say” about high fructose corn syrup. and my second post: “a response to Ms. CornRefiner’s comment which included the original comment and a full blown heckling response to the HFCS lobbyist who tried to highjack my blog with links to websites explaining how and why HFCS was good for me. I don’t think so. WFMW: office chairs at the kitchen table. Last year we experienced a shift in homework time-continuum as FavoriteSon tried different locations to complete his homework. Neither of my kids likes to be isolated during homework time. Neither of them want a desk in their room to do said homework. I’m sure it’s because they just can’t bear to be apart from me. But seriously, this is a good thing. Because they both tend to “daydream” (code word for mild ADD) and I find myself asking “Are you distracted?” “Whatcha doing?” and “Status report, please.” when I see them doing anything BUT homework. This year, we had a plan. We took the kids to Staples and Office Depot to pick out chairs. FavoriteSon settled right into a $90 chair. A little steep, but we agreed with the condition that he N E V E R complain about the seating for homework again. And that he MUST A L W A Y S sit at the kitchen table to do his homework. PinkGirl kept picking out cushy velour chairs FirstHusband and I vetoed every one, envisioning a daily task of removing crusty food from an increasingly hard and stained surface. ewww. We finally found a $70 chair for her that was COMPLETELY adjustable. The seat goes up and down and tilts forward and backward. The back goes forward and backward as well as up and down. The entire chair moves up and down. And the arms are adjustable. Two evenings of homework and so far, so good. And I’m okay with that. This works for me – and my family.